For most of us, when we speak about Athens we think of the Acropolis. This place is by far the most unique and most popular historic site in the capital of Greece. The fact that his citadel is built on the top of one of the Athens hills makes the place gorgeous. In the Acropolis, you can find several ancient buildings that have been here since … forever. It is not necessary to say that if you do not visit the Acropolis, there is no point to even come to Athens. The Athens Acropolis is probably the most interesting historic site in Europe. As we all know, Greece is the creator of the Olympic Games. We all have seen movies about the first Olympic Games, but could you believe that you can still see a stadium for 6 B.C. ? I could not believe what my eyes are seeing when I saw this gorgeous construction. The Panathenaic Stadium is an ancient multi-purpose stadium that was the host of the First EVER Olympic Games in 1896. Even if you do not care about sports, you still must come here and visit this stadium. I am a huge sports fan that had been to plenty of places in the world, but while I had visited the Panathenaic Stadium, I was feeling like an athlete that competes in the Olympic Games. There is no other place in the world that is more ”sportly” iconic than this stadium. Everyone had heard about Zeus, Hercules and all of the ancient Greek Gods, but have you heard about the Temple of Zeus. I am guessing most people had seen pictures of this wonderful historic site located in the center of the Greek capital – Athens. According to the historians, this temple had been completed in 2 AD and since that it is one of the mighty temples not only in Greece but in the whole world. Originally the temple had 104 columns. Do not hesitate to visit this piece of history dedicated to the God of the Gods – Zeus. Plaka is an old historic neighborhood of Athens known as the Gods’ Neighborhood. This nickname comes from the fact that the place is located just next to the Acropolis. 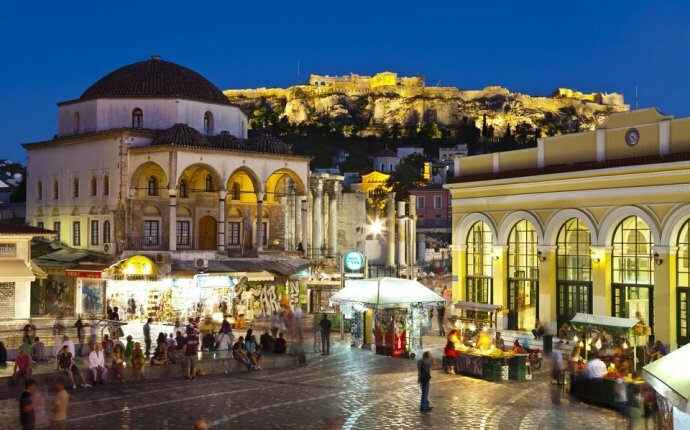 This makes the visit in Plaka even easier because there is no way in the world in which you will come in Athens and you will miss the Acropolis. So after you visit the top attraction in the city, save few hours for a tour around the Plaka neighborhood and its wonderful small streets that look like a labyrinth. Since we already talked about Temples, Athens has another temple to offer to tourists. While the Temple of Zeus is not really well preserved, the Temple of Hephaestus still stands in the same condition in which it was originally created in 415 BC. You can visit this temple if you go to the Agora of Athens area which is located on the north side of the capital of Greece. The fact that the temple is in pretty much perfect condition makes the place perfect for every history fan. Another important and interesting temple located in Athens is the Erechtheum Temple that is dedicated to Athena and Poseidon. This temple was built in 410 BC is a typical Ionic style. The temple is pretty much well preserved and it is an interesting attraction for the history fans. As you might be guessing just like most of the top attractions in Athens, this temple is also located close to the Acropolis. The interesting part of the modern history of the theater shows that performers like Andrea Bocelli, Elton John, Jose Carreras, Motserrat Caballe and Goran Bregovic had performed on the Odeon’s stage. Areopagus is a rock located close to the Acropolis in Athens, that is full of history. The place was mainly used as court from the ancient Greeks. Another interesting thing about the rock is that it is the home destination of the ancient Greek myth about the murder of Poseidon’s son.